Born and raised in a small town near Dallas, Texas, Grant Wise represents a true example of a long-time Pagosa Springs visitor fulfilling his dream of relocating and living the Pagosa lifestyle. A Division I college soccer player at the University of Memphis and Winthrop University, where he earned his degree, Grant worked as an Analyst in the Business Banking Group at BB&T in Winston-Salem, NC before moving to Wells Fargo. There, he joined the Commercial Real Estate Group as an underwriter, working with new multi-million dollar construction and bridge loans for Multi-Family, Industrial, Office and Retail properties, as well as lines of credit for homebuilding companies. In 2016, after 11 years of visiting here with his family, Grant made the move to relocate to Pagosa Springs and pursue his passion for real estate. With a true love for all that the area has to offer, Grant brings to the table his real estate knowledge and extensive banking/analytical background to help buyers and sellers turn their own Pagosa Springs dreams into reality. 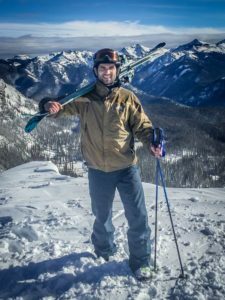 In his spare time, Grant coaches youth soccer for the Pagosa Rangers Soccer Club, and enjoys Snow Skiing, Fishing, Rock Climbing, Mountain Biking, Rafting, Horse-Back Riding, Camping and soaking in the Hot Springs. As an out-of-state property owner, I talked with several real estate companies before choosing Grant to be my listing agent. He was very knowledgeable and described every step in the process of selling the property. When situations occurred, he thoroughly explained the pros and cons of each option so I could make an informed decision. As other tasks were needed, he recommended people who performed excellent services. Grant advised me on negotiations and was instrumental in closing the sale. I highly recommend using Grant for your real estate needs. – Fran C.